Olivier Hoelzl (LIVIL) is known for his intricately cut hand-cut stencils of people and objects for his murals and installations. When did you first become interested in street art? In the nineties I was a big fan of Banksy. I never did street art or graffiti when I was younger. First, I studied painting at the University of Applied Arts, Vienna. Later, I met an international artist called Dan Perjovschi. He is a contemporary artist and he helped me find my way. He told me that when you are a young artist it is important that you find a way to make yourself flexible and look for more mobility or you get stuck in the system. That’s how I decided to progress with my stencils, which at that time I used for painting. Today, I fold my big format stencils and travel with them. 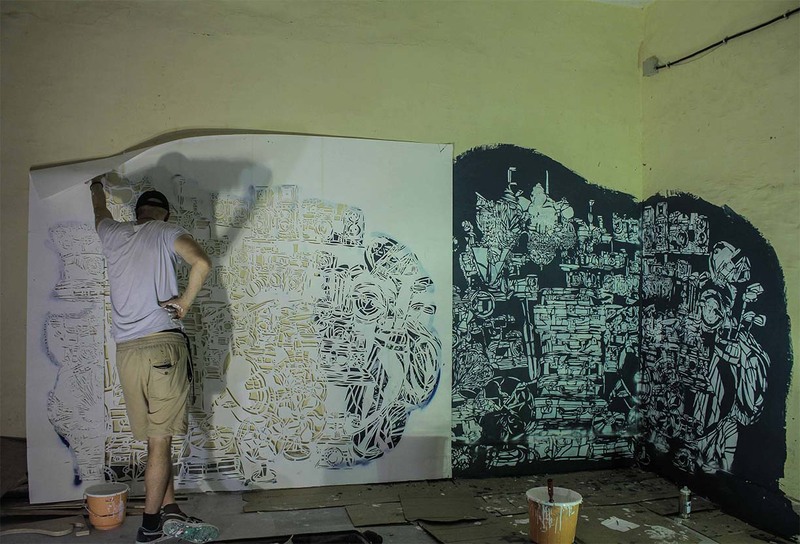 What’s your first work as a street artist? My first work as a street artist was in Yerevan, Armenia. My first artworks were motifs of groups of people from different communities. What’s your main goal with your artwork? 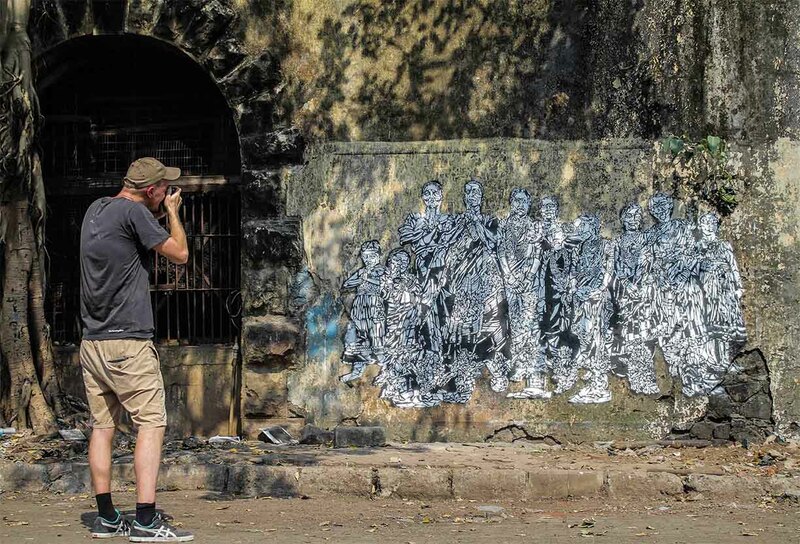 St+art Mumbai 2017 Urban Art Festival’s Curator Giulia Ambrogi wanted the artists to work within the context of Sassoon Dock. I did thorough research on the community from my home in Vienna, Austria and with the support of the organising team, I gathered all the necessary material for my installation. As I like to work on topics concerning communities, I decided to create an artwork about the Koli women from Sassoon Dock. During the creation period, I observed the life of this close-knit community, lives of the women peeling the shrimps in particular. It is a hard life, with a great sense of community. The main artwork shows a group of women worshipping their god of sea. Inside the exhibition building you can see it as a 3-dimensional light installation. Outside of the exhibition space, I have painted a similar work on a wall in Sassoon Dock. What is the idea behind your artwork? How long has it taken you to finish it? It is a contextual artwork. I would probably have never known the Kolis if it hadn’t been for the exhibition. Ambrogi and her creative team are not just doing an exhibition; they also give the abandoned buildings at Sassoon Dock a new life. By creating my artwork, I wanted to get into a dialogue with the Koli women. Our worlds are very different. It would be great for me if all the visitors coming in and seeing my light installation about these women realise that these are the original people of Mumbai. The first ones to settle in the city! I just loved it. I have already lived in Mumbai 12 years ago. At the time I was still working in the field of business for the Times of India so when I came back after all these years, I felt very comfortable. Sassoon Dock has been overwhelming – on the one hand, the fish smell and on the other side the authentic life of the people. Witnessing such authentic moments is a real life changer. You become more open-minded and in fact, wiser. 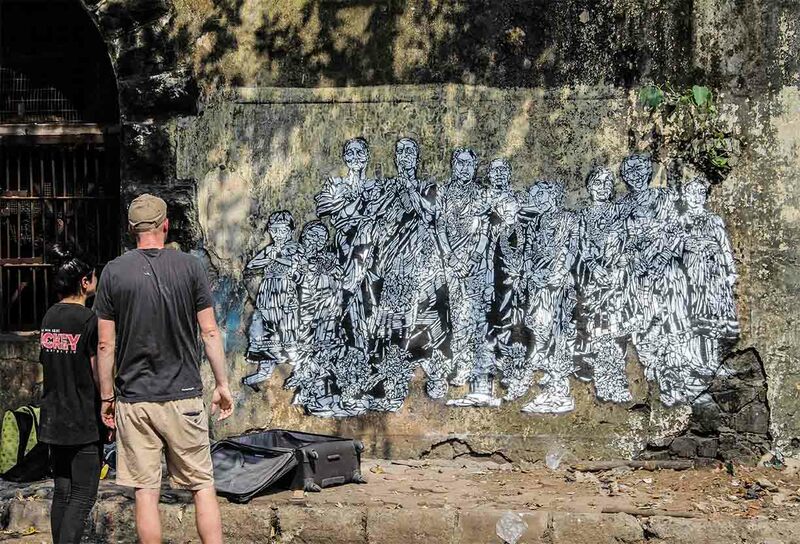 Your favorite street artists around the world whose work inspires you? SpY from Spain, who is also a participant at St+art. I love his approach that comes with a political dimension.